I was wrong, the bloat is still here. How far along? 11 weeks. I can't believe how fast time is going by. Maternity clothes? I wore my maternity jeans for the first time on Thursday and they are awesome! They just have an elastic waistband instead of a zipper and a button. Perfect for the coming weeks. Sleep? I am getting up a few times a night to pee which makes things difficult, but in general I am able to sleep pretty well. Best moment this week? Finding out that all my test results are pefect. I am not a CF carrier, I am not Rh negative, I am still immune to rubella, etc. Food cravings: Cheetos. I would eat them for dinner if I could. Movement? Do gas pains count? 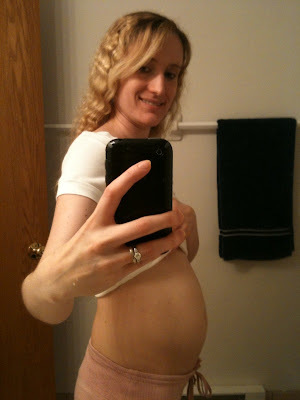 Milestones: Baby should grow to about 2 inches this week! You look great! I can't believe you are already almost to second tri! Mchupie! You look great and adorable! Looks more like your starting to rock that baby bump and that bloat is gone! I'm so glad everything is going great! You look great! Glad to hear everything is good. See you soon. That looks like a baby bump, not bloat anymore. Welcome baby bump! You are looking too cute!! Love the bump!